Going to GenCon is all about doing some serious gaming. It’s also all about getting some new games and stuff to take home with you when the show is over. Though I spent most of my time running Deluxe Tunnels and Trolls for gamers who signed up to play with me, I was able to spend some time networking, and I did pick up what looks like some pretty cool stuff to keep me entertained for the rest of the year. 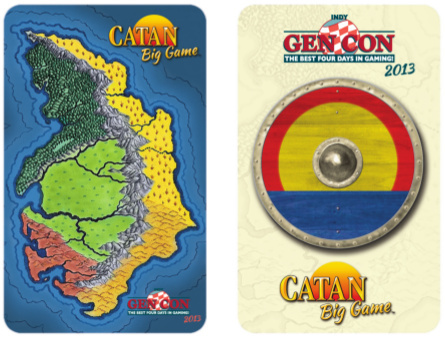 The number one acquisition in terms of uniqueness was the two-player Settlers of Catan variant from the Big Game at GenCon. that Mayfair sponsored on Friday evening. Rick Loomis, Steve Crompton, and I all participated in this event, which set a world record for the Guinness Book of World Records for most players in a single board game. We helped set a record with 922 participants in a single game. We sat at long tables and played head to head with one opponent across from us. We could trade with people to our left and right on both sides of the board. Winner had to amass 25 victory points. Participants got to take the game home with them. I got a map, a set of pieces in a beautiful purple color hitherto unseen in the Catan universe. And I got the Catan cards: sheep, wood, brick, ore, and grain in one deck and the regular development cards in the other. They have special backs to commemorate their importance to GenCon and the development deck has an extra card–1 victory point for GenCon. These cards are just brighter and better looking than those in the basic game. Anyway, I was happy to play in this event, and I even got quoted and filmed talking about how cool the event was for a local newspaper on-the-spot blog. I found it online, but I was terrible, so I’m not going to give you the link. 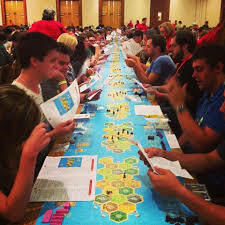 Actually the Catan game was the only thing I got to play that I didn’t GM. I did, however, acquire the following cool stuff. Here’s a game that lies dreaming until the stars are right. I was walking around the Exhibit Hall and stopped to chat with my old friend Charlie Krank. We discussed Kickstarter projects for a minute, as Chaosium has done a KS this year roughly 10 times as successful as my own. 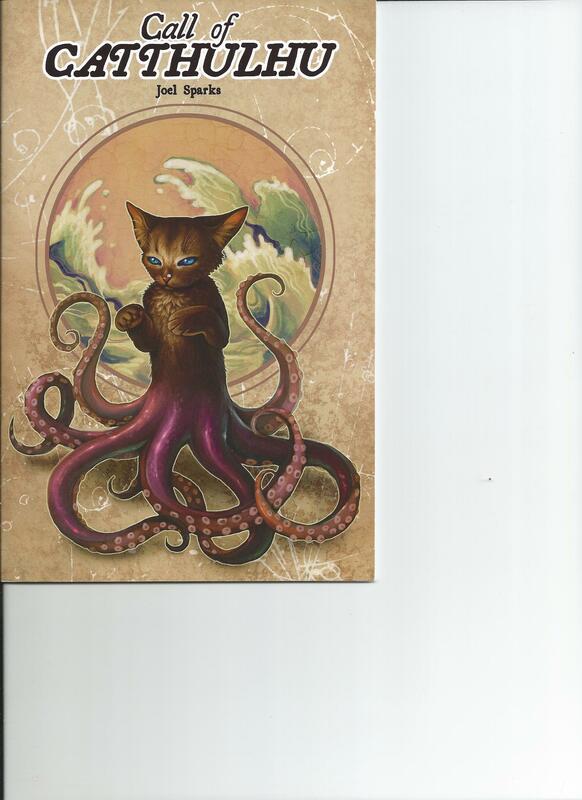 He smiled and gave me this prototype version of the new Call of Cthulhu edition. 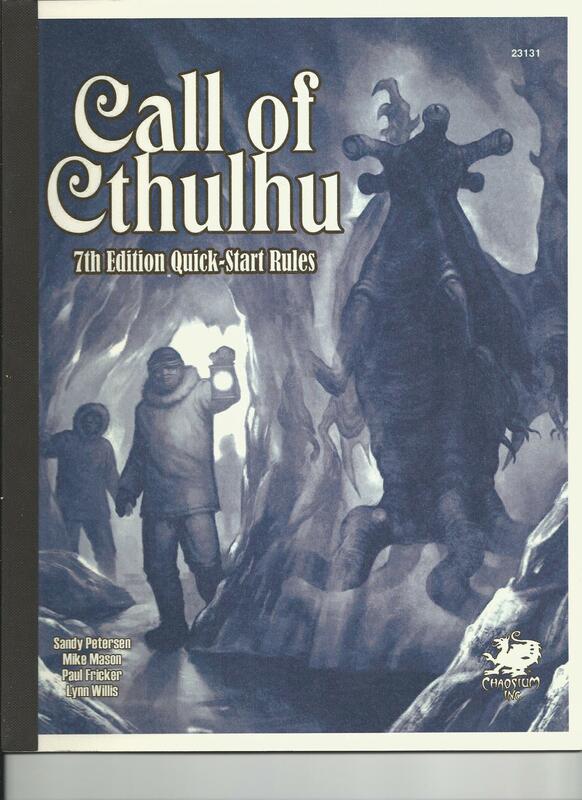 I have only skimmed through it, but Call of Cthulhu was always a great game, and the new version is going to be even better. I saw Sandy and talked to him a little at the North Texas RPG convention in Fort Worth in June. He and Cthulhu remain the best of friends, and he was showing off the prototype of an Elder Gods conquer the world board game that had the most amazing pieces, and really looked like fun. I was running dT&T, and he was running Cthulhu, so I didn’t get a chance to play in any of his sessions, but if he gets it produced, he is going to have another mega-blockbuster success with it. 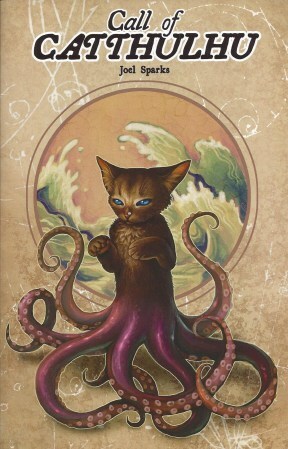 In Call of Cathulhu, heroic cats oppose the efforts of various mystical forces to undermine human civilization and the feline rule. I was talking to John Wick at the Independent Gamers Association booth when Joel Sparks came up and said hi. He was showing off the mini-game that he made for GenCon, and when I saw it, I declared that I must have it. It was his last copy, but, being the magnanimous and Great Guy that he is, he gave it to me, and signed it o me to prove it. I gave him my product which was the reprint of Tunnels and Trolls first edition. This game is brilliant, but cutesy. Young people, especially young ladies with a fondness for cats, will love it. I hope I get a chance to run it for some teens and pre-teens some time. Original in execution, design, and writing style, this is a family friendly game that everyone can enjoy. A new sourcebook for John Wick’s decadent rpg: Houses of the Blooded. The game trading between designers wasn’t quite over yet. When I promoted Cathulhu from Joel, John came back and presented me with the Wilderness manual. He owed me one. I had given him a copy of my new board game Dwarves and Dragon two weeks earlier at MaricopaCon. I thought at first that this was another of John’s gamebooks–the man is so incredibly prolific–but it turns out that Wilderness is written by Jesse Heinig with some additional material by Fabien Badilla, Jessica Kauspedas, and John Wick (himself). I probably know Jesse by sight, but I don’t know him well. I do know all his co-writers well enough to greet them in passing (grin). 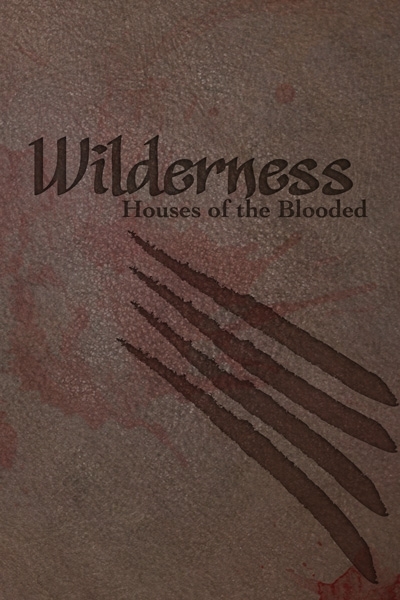 This is a 193 page sourcebook for running Wilderness Campaigns for Houses of the Blooded. Houses is primarily a larp rpg, and I participated in it for several months in 2012, helping to create the House of the Boar as its first lord. I doubt if any of my live-action role-playing had any effect on this book, however. It is very well-written and contains some fiction by way of examples that is a total howl to read. Dungeon delving isn’t all rpgs. There are also board games and card games and card games that are board game like this one. Sunday was my trade-with-other-game-designers day. You wait till the end to to this kind of gathering of free stuff because you want to give everyone a chance to sell all they can to the gamers at the show. 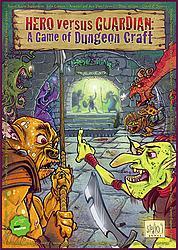 Aaron Kreader is a fantasy game designer who does very entertaining card game variations on the whole men and monsters in the middle ages theme. He has also done Traps and Treasures and Villages and Villains. He dropped the alliteration this time to posit the idea that there are Cosmic Forces involved in your average dungeon-looting expedition. The Hero is the one that is trying to make off with the treasure in the dungeon. The Guardian is the one that is trying to protect it. Both sides work through minions. The Hero force uses Adventurers. The Guardian force uses Monsters. When the Looters meet the Guardians, who will win? Play the game and find out. Aaron and his lovely wife Lisa epitomize everything good about the independent gaming movement. They are friendly, funny, and absolutely immersed in the world of gaming–living the dream, and seem to be on the rise. I wish them well, and am always happy to see them and their games at the conventions I attend. 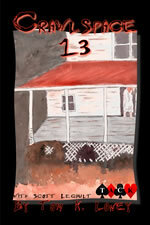 You would never guess from the cover, but this is a game about starring in horror movies. Speaking of free things that just came to me, Crawlspace-13 materialized in my hands while talking to my friend Tom Loney on Saturday. Tom is married to Chrstina Lea and is also a talented game designer. They use their own Peryton Press to publish their designs, and they also do some Tunnels and Trolls publishing there. I really like Crawlspace. It appeals to the extrovert in all of us–the idea of starring in a movie. It gets away from the standard tropes of fantasy role-playing as if we all lived in Middle Earth or Trollworld. It shows the American imagination at its finest. And this is the final Piece de Resistance of my GenCom games grab. 2013 was a good year for pre-release versions of games at GenCon. The industry is so big now that it would be a full-time job to try and keep track of all the new games coming out. I only really try to keep up with my friends, and even at that, I do a very poor job. TOO MUCH GOOD STUFF! But Christina Lea is a friend of mine, and a member of Trollhalla, and with her showing her newest game at the con, I felt I should support her efforts, so I made a point of buying a copy of Qalidar: Resistance from her Peryton Press. You would not think from looking at Christina that she would have such a weird imagination. She is an attractive woman with a dry sense of humor, but inside these pages she comes off stranger than Madame Blavatsky. That’s good. I like WEIRD. Sometimes I wish my imagination was as good as those of my younger friends. Qalidar is a marvelous name for a world, but in Ms. Lea’s hands it is more than a world–it’s a whole multiverse where everything is more than it seems, and GREATER SIGNIFICANCE fairly oozes out of the pages of text. 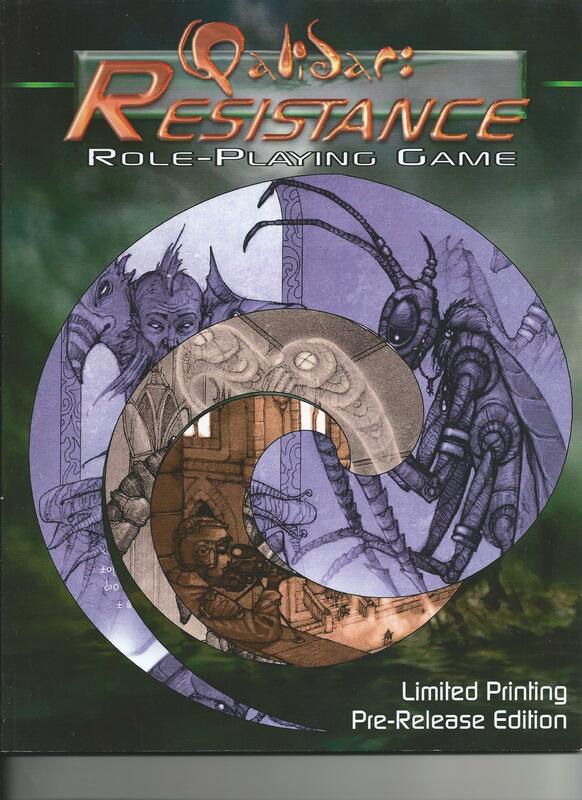 I have actually read (almost all) of the Resistance rpg book, and I have to say, I’m impressed, intimidated, and confused by it all. Impressed by the concepts, intimidated by the creatures (this seems like a very difficult rpg to survive), and confused by why she would want to stay with the D20 style of game mechanics. I associate D20 with THAT OTHER GAME, and so don’t care for it much. Perhaps she thinks that is its strength. Oh well. I have gamed with Christina in her (sick and twisted) universe, and would be happy to return any time–D20 or not. With all that loot, and considering that I sold out of 1st edition, Saving Fang, and Dwarves and Dragon, I would say that 2013 was a very good year for me at GenCon. If you have any GenCon experiences, or comments on the good stuff you picked up while you were there, or even if you didn’t get to go, and are just jealous of the glamorous game-filled existence of we GAME DEISNGERS (snort! ), why not leave a comment?